One of my favorite cat books last year was the award-winning The Dalai Lama’s Cat by David Michie. The charming novel of heart and soul chronicles the rags-to-riches life a Himalayan cat who is rescued by the Dalai Lama. The sequel, The Art of Purring unspools the further adventures of the Dalai Lama’s cat and her search for happiness from the top of the world. There’s a lot of pressure when writing a sequel to a popular book and I admit to some trepidation before dipping in, but I was hooked on page one which made me very happy. The writing is witty, warm and truly wise. The characters, some familiar, some new from cafe to yoga devotees, Buddhist monks, tourists, dogs and of course, one special cat, feels like coming home. Cat lovers can armchair travel to a feline Shangri-La where they too can learn what makes them purr. 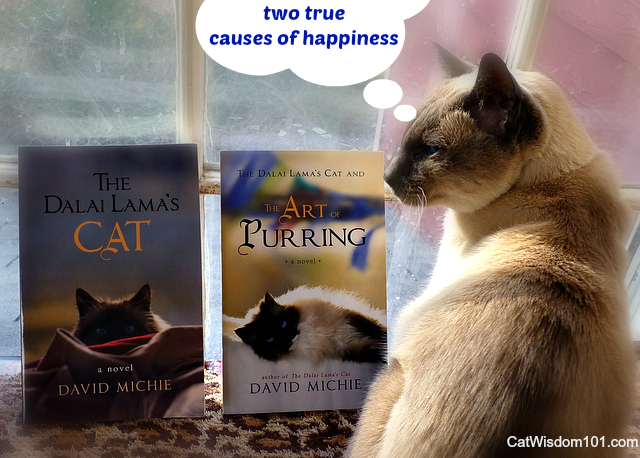 I had the pleasure of sharing a Q + A last year for The Dalai Lama’s Cat and today for The Art Of Purring with author David Michie. Merlin gives an enthusiastic four paws up for both books. LMW: The Dalai Lama’s Cat shared life lessons couched in Buddhist philosophy. The sequel, The Art of Purring expands on the themes of happiness and seeking life purpuse. I feel the book’s principles and themes are universal. What can you add for those readers who do are not Buddhists or do not meditate? DM: The book is very much an offering to people who are neither Buddhists nor meditators, but who are interested in finding a deeper purpose to life, or at least more enduring causes of happiness. Buddhism is not an evangelizing tradition. The aim of Buddhism has never been to convert other people to Buddhism, but to provide tools that may help them become happier – whether that’s happier atheists, Christians, Jews or whatever. 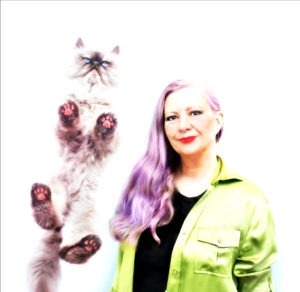 LMW: Before The Dalai Lama’s Cat was published a year ago your own cat died. What have you learned about cats and cat lovers in the past year while writing The Art of Purring? Have you thought of adopting another cat or two? DM: My wife and I would love to adopt more cats and we support our local Cat Haven. We still have Mambo who, like Princess Wussik, adopted us. But as we plan to spend extended periods overseas in a few year’s time, we don’t think it would be sensible to take on more pets right now. In the past year I have learned that cat lovers are incredibly active online – I never cease to be amazed and humbled by the level of support for the Dalai Lama’s Cat Facebook page! LMW: The Dalai Lama’s cat, or HHC as she’s referred to, is not a huge fan of dogs but dogs play a pivotal role in the Art of Purring. Can you elaborate without spilling the beans? Do you think cat lovers are different from dog lovers? DM: I’ve looked at some interesting research on this. Many people, myself included, love a great variety of animals, not cats exclusively. But people who like cats alone do have some defining characteristics, according to at least one study. Cat people tend to be more curious, non-conformist and more interested in unconventional ideas. In other words, they are ideal candidates for a book written by the Dalai Lama’s Cat! I hasten to add that I discovered this only after embarking on the series – I can’t claim it was a clever marketing ploy! Regarding the cat/dog dichotomy, I can only encourage people to practice equanimity in regard to both – we are all a lot closer to both of them than we may care to think! LMW: The reader is left with a few cliffhangers inviting a third novel. What can you tell us about the trilogy or series? DM: After the warm support I have continued to receive about The Dalai Lama’s Cat, I realized there is an appetite for more books. So yes, book two resolves a number of the cliffhangers from book one, but not all. And book two leaves further questions unresolved. I am leaving place-marks with each of the books and I do have an overarching plan to provide full resolution in the future. LMW: You have written both fiction and nonfiction in other genres. Any desire to write another non–cat book? DM: Very much so. I have actually just finished ‘Why Mindfulness is Better than Chocolate’ which will be published in June 2014 in Australia. It’s a non-fiction exposition of the practice and benefits of mindfulness. I also have in mind a thriller series set in the Tibetan Buddhist world. Whether or not I can bring my cat-loving friends with me on the journey remains to be seen! LMW: The loving preparing, serving and communal sharing of food is a key thread throughout the book. HHC derives great joy from the pleasures of fine dining. Would you call food a true cause of happiness? And do you enjoy cooking? DM: Food falls into the category of ‘hedonia’ – what we get from the world to give us pleasure. While I enjoy food, I can’t claim to be a great cook, although I am an enthusiast (vegetarian). The other category, ‘eudemonia’ is what we give to the world to achieve more enduring happiness. The two categories are not mutually exclusive of course, and those who cook to give happiness to others can benefit in both ways! LMW: Much of the book’s action takes place in the Himalaya Café in McLeod Ganj, India. It’s a fictional location in a real area and sings with charm. So much so, I felt like jumping on a plane to visit. Did you model any of the book’s locations on actual places? DM: Yes. Like so much else about most fiction, the Himalaya Book Café is a composite picture of a number of my favourite places including Colbert on Sloane Square, London, Bodhi Tree in Perth, Australia, and Urth Café in West Hollywood. LMW: Books on life after death and heaven are popular these days. Pets are often thought to go to the “Rainbow Bridge”. Do you think cats have souls and what are your thoughts on the Rainbow Bridge, heaven or an afterlife for cats and dogs? DM: The Buddhist view is that all mind-havers, including pets, have consciousness and that subtle consciousness continues after physical death. After ‘death,’ as in life, we continue to experiences the effects of previously created causes. LMW: You have many American and Canadian fans. Any plans for a North American book tour or visit? DM: Not right now, Layla, but if I can be allowed a commercial plug, if people would like to sign for updates on my website, I’ll be sure to let them know when this happens. Visit www.davidmichie.com or The Dalai Lama’s Cat Facebook page. If you haven’t read The Dalai Lama’s Cat, I envy you. You get the double pleasure of reading the books back-to-back without waiting. If you have read The Dalai Lama’s Cat, The Art of Purring is worth the wait. The release date is November 26, 2013. This feline romp to Shangri-La will having you purring with delight. Let the purring begin! Five lucky Cat Wisdom 101 readers will win a copy of The Art of Purring. To enter our giveaway: simply leave a comment before 11:59 PM ET, Dec.,8, 2013. Social media share this post and leave a separate comment mentioning where you shared or follow. Disclosure: We received a review copy which in no way influenced our review. If you must have a copy right meow, visit Amazon. Looking forward to reading the book. My cat Hershey looks just like the cat on the book cover. She is 16, and is such a sweet girl. Would love to read these books! What a lucky cat! Sometimes books arrive in your life at that perfect time- I did a back to back reread of The Dalai lamas Cat and am now “Purring”!!! No wonder the Himilayan Book Cafe seemed familiar… I too love The Bodhi Tree Cafe in perth that DM modeled it on with a twist of Chinta Cafe on the side!! These beautiful books reinforce how wonderful the synchronicity of life is. Purrfect. After having been to Tibet, I felt empathy for the inhabitants. The armed presence and changes to their society is troublesome. Long life to the Dalai Lama. I am a great admirer of the Dalai Llama and his love of life and cats. I have had cats for most of my life and dogs. I presently have two beautiful Himalayan kittens who I love. I also love to read about cats. For that reason I would love to get this book and read it. Thank you. I’ve been inspired by the Dalai Lama for about 20 years, and I’d love to tead this book! Haven’t read the first book, but love & follow all the posts on FB! Purrfectly delighted with the Dali Lama’s cat! I absolutely loved the first book and have recommended to it so many people. I look forward to reading the second! Oh! What a wonderful book! I’d love to read this! I hope I win! Read the first one — really looking forward to this one! please select me as id cherish these cat lover books. I am a great cat lover and both these books sound like great reads. Thanks for the chance to win – Would love to have a copy! I’ve read and enjoyed both books. A purr-fect feline Philosophy and witty observations about life. We all need to purr more and hiss less. I have been a cat person all my life. I’ll do anything to keep a cat happy and my new kitty caled Rosie can already twist me around her little white paws. Rosie discovered me at Cataholics Kitty shelter one day when I was busy sighning the adoption papers for a tiny ginger and white kitten. She came and sat on my lap and began to purrrrr and the lady in charge told me that 7 year old Rosie had been patiently sitting on her desk for three months, just waiting for the right person to go home with. My husband and I fell in love with her immediately and she has now been the cat-in-charge at our house for three happy months. We love her more each day and feel so happy that she has come into our lives. As a cat person for most of my life, I would feel blessed to win a copy of The Art Of Purring…The Dalai Lama’s Cat shares so much wisdom…can always learn more! Cats are the windows to our souls. My babies are all rescues and every chance we get we cuddle or go exploring. Every personality is different. There is no reason to try and harness that energy. I love to read beautiful Quotes on Dalai Lama’s Cat page in FB. My cat named Hari which I believe is a very loving soul with me. He is one year eight months old male cat. He unfortunately is not well as my neighbour hit him so badly that he has spinal injury and it has been a month now that I am looking after him. With God’s grace now he can walk and climb the stairs but he has yet to recover from his urine and bowel problem. Doctor say it will take time. I just wish that all of you pray that he recovers soon and he is back to his normalcy. I love him very much and wish to see him running and playing with me again. Please pray for him and send him blessings. Thanks. I follow HHC on FB every day. There’s so much wisdom to divine from HH, but even more on a different level from HHC. Love them both dearly. Thank-you from Paul in Gothenburg, Sweden. I have five rescue babies and would love to read these books! Im actually very jealous, because I purchased one for my uncle for Christmas but truly want to keep it for myself… but I would never do that! I enjoyed the Dalai Lama’s Cat, so I look forward to Michie’s second “cat” book. I don’t have these books, but I would truly enjoy having any of them. I love cats. Would love to read them both! The best book I read all year, can’t wait for the next one! Looking forward to reading both these books recommend by my 5 Himalayans. They want me to know what they are thinking. Love the previews! Thanks. These books are on my xmas wishlist, too. The cats are hoping for a heated cat bed. Santa has been alerted. Lovely interview. Have read many of your books and have attended talks when. He comes here to Bloomington, IN, and have have walks, lunches and the lawn at the Monastery here also. I feel so honored to be able to visit this spiritual sacred ground. Read the preview and loved it! As one of my favorite things to do is snuggle with my cat and listen to her purr, I think I still have more to learn from her. I’m having trouble posting this comment as my cat is sitting on my lap. I;m looking forward to reading the book. What a great interview! I loved the ‘Dalai Lama’s Cat’ and am looking forward to reading The Art of Purring. I’m am just about to share this on Facebook, just about meow! Anxious to read this great book. We just took in another homeless kitten couple months ago and named this precious calico Tembah!! I can’t wait to read the Art of Purring! I loved the Dalai Lama’s Cat. I really enjoy and love your facebook posts of pictures of cats and clever words of wisdom! I love David’s books! I bought the Dalai lamas cat for my father but never got to read it myself before the last time I spoke to him. Thanks for a great interview! I look forward to reading your books. A purr-fect read for the holidays. Cat purrs heal me when I’m blue and add to my mirth when I’m happy. Loved the Dalai Lama’s Cat and definitely will purchase this one! Loved the first one, can’t wait to get my hands on this one!!! Having read and enjoyed The Dalai Lama’s Cat, I am looking forward to reading this most recent book. Thank you. Sounds like a wonderful book! I love the Dalai Lama’s cat. Can’t wait to read both books. I follow on Facebook. Oops! That anonymous post a moment ago was me. As a (poor) college student who has studied the Dharma traditions (Buddhism, Hinduism, Jainism) and is a life-long cat lover, I would love a copy of this book. Can’t wait to read this book. Shared on FB 2x. Oh I really want to read this to my beautiful cat family! Love the pairing of a beautiful cat with the wisest man in the world. My husband is getting me The Dalai Lamas Cat for Christmas. I would love to have The Art of Purring to read right afterward. Still reading the Dalai Lama’s Cat and thoroughly enjoying it. Such insight. I’m a real kitty lover anyway. I’m enjoying the Dalai Lama’s Cat and looking forward to The Art of Purring!! Loved The Dalai Lama’s Cat, can’t wait to start The Art of Purring. Such wonderful writing! I already have The Art of Purring, but I would truly love to win a copy for my best friend as a Christmas surprise. I am a fan of the Snow Lion from the very first book! The books sound wonderful. If I don’t win, I hope I get one (or both) for the holidays! These are great books! They are in many of my friend’s holiday gift bags this year! I shared on facebook, twitter and pinterest! Good luck with your sales! I would love to win. Already read “The Dalai Lama’s Cat” and it is a wonderful book! My friend got me the first book and so I would love to win this contest actually to give her the new book as a surprise. we both love the first one so much. thanks for the contest. I would treasure these as I treasure all felines. Would love to win this book! Have a houseful (seriously) of my own. I am reading The Dalai Lama’s Cat now and loving it.! Would love to win The Art of Purring. Yes! This is great! I’d love to win 🙂 Thanks for the chance! I have always wanted to be able to purr and hope this book will teach me how! I shared on Pinterest on the cats board. I love the title and would love to be so fortunate to win this giveaway so I can read and add this book to my cat library. This book looks so cute, I would love to win. I love cats & books ! I would love to win this!!! I find your site to be so very peaceful and warm, keep up the great work! Wow, this books sounds so great. Please enter us! Thank you! I Just lost my cat forever and i have to learn to be without her, i think this book would help me. I have to win one please!!! I would absolutely love to win this book. The first one introduced the philosophies of Buddhism in such a gentle way. I can’t wait to read this one. In case you didn’t mention it elsewhere I hope others realize that The Dalai Lama’s Cat won the Best Novel Award in the CWA contest for 2013! And it had some pretty terrific competition. I’d love to win The Art of Purring. I was so impressed with The Dalai Llama’s Cat and the way that David Michie put basic and enlightening Buddhist truths into the storyline. Clever, easy to read and delightful 🙂 Looking forward to another wonderful book. I shared this blog post on my facebook page for an extra contest entry. Thanks! I LOVED the Dali Lama’s cat and would be thrilled to read the sequel!! Thanks, great contest! What cute-iful kitties. Us cat lovers here would gaze at these books for hours. I can’t wait to read both of these books. When I was in college I took a class on different religions and beliefs. I have always been intrigued by the Buddhists. I truly can’t wait to delve into these two books. Luved ,luved The Dalai Lama’s Cat! We just know The Art of Purring is going to be super good too!!! We just love books about cats!!! I am looking forward to reading this! always loved the daily posts, would love to read the book! humm, wonder if my first post got eaten in cyberspace? I adore The Dalai Lama’s Cat so much I shared it with my yoga class. This is the first I’ve heard of a sequel, and I’d love to read it, too! Having just finished reading the delightful “The Dalai Lama’s Cat”, I can’t wait to indulge in some more of David Michie’s writing ‘purrfection’. I’m a budding bodhicattva always on the path to encatenment! Would love this book to purrrrrrfect the practice on the path! Oh I also posted this on my Facebook page ‘Natural Inspiration Station’ and my personal page and will post on the Natural Inspiration Station Blog too! I would love to win and get the copies signed to auction off at a local animal rescue groups 2nd annual Fundraiser in Feb.
Read the first and can’t wait for the second, so glad there are more, thank you!! Would love to have a copy. Two of my great loves, cats and reading as anyone who knows me can attest to. Can’t wait to read this one. Purrs to everyone! I am really looking forward to this book to share with my Himalayan cat Tillie! Oh, these need checking out for the Christmas wish list. The Dalai Lama’s Cat was my paws down favorite book of 2013, and I cannot wait to read The Art of Purring!! Very nice interview. Sounds like a definite good read..Great interview Layla.. Sounds like a great book and I enjoyed the interview. I adored The Dalai Lama’s Cat and I’m delighted to hear that there is a sequel. I’ve shared on Twitter where i have over 12000 followers. I would love to win a copy of The Art of Purring. That sounds like a great read! We have the first one and terrific it is fur sure! The boyz are very happy that yet another hooman has discovered the secrests of cathood and I am just delighted to read this perspective of the most delightful creature on earth. Thank you for this great interview Miss Layla. Please don’t enter us (Mom already ordered hers) but thank you for the giveaway. These are books everyone will enjoy. Sounds like and interesting book. Has the entry date passed, as it is listed as Nov. 8, 2013? I really want to check out both these books! I’d love to win…the first book was wonderful and inspiring.